There continues to be a stark divide in the conditions across Europe, with almost the whole of Austria, Eastern Switzerland and German resorts in the midst of an extended period of heavy snowfall, giving fantastic conditions across the mountain, though some locations have been closed due to high winds and safety concerns, according to the latest ski report from the Ski Club of Great Britain. Fresh snow is falling across much of British Columbia, and more widely in the Pacific North West. Heading further south, this coming weekend is looking to see fantastic skiing across the Sierras, including resorts around Lake Tahoe and Mammoth. Further inland, there is unlikely to be much change in the majority of Utah or Colorado based resorts. 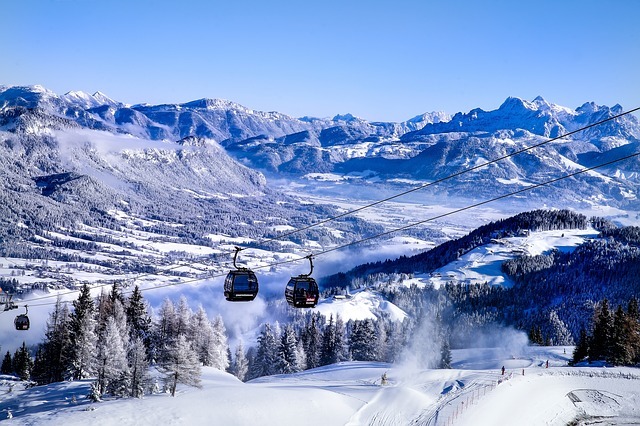 There has been upwards of a metre of fresh snow in many Austrian resorts since the start of 2019, and an equal amount more on the forecast. This has made a radical change to the conditions across the impacted areas, with knee deep powder, snow down to the valleys, alongside high winds and such substantial quantities as to disrupt lift operations in some locations. Conditions on Saturday and Sunday will be impacted by an arriving area of high pressure, offering a short respite from the snowfall and some more hospitable conditions for those whose skiing is more piste focused. Excluding some snowfall in the latter part of next week in the Les Sybelles area, much of the French Alps remains disappointingly bereft of snowfall, instead giving hard packed and icy slopes on piste, and solid, challenging off-piste. This has also seen far less substantial snowpacks than were seen last season (although bear in mind that it was an exceptional year). On the plus side, cloud cover had returned over the region, and earlier this week, snow had begun lighting falling in the most northerly of the resorts in the Haute Savoie. Current forecasts show this pushing further south, with the hope this provides a welcome improvement in conditions. Resorts in the east, especially the Graubünden Canton, have seen fantastic conditions, with Sunday January 6 in particular delivering as much as 50cm of snow in resorts such as Davos/Klosters, Arosa/Lenzerheide, as well as many others nearby. Those in the Valais, including Saas Fe, Zermatt, the Four Valleys, and Grimentz/Zinal have seen a longer period without recent snowfall, slowly limiting the available off-piste options. The groomed runs are becoming more hard packed, although certainly skiable, and are tending to be somewhat better than those in France. A mix of artificial snow, and cool nights but sunny days are allowing the otherwise firm slopes to soften over the course of the day without deteriorating overnight. Excluding a handful of resorts on the Swiss/Austrian border, conditions in much of Italy are bright, sunny, but lacking in recent snow. Much of the Dolomites is surviving purely on artificial snow, with negligible off piste skiing available and much of the slopes extremely hard packed and thin. This mirrors much of the ski areas in the country, which have been devoid of snow for upwards of three weeks in some instances. For those looking to ski in Italy, the exceptions would be resorts such as Val Senales, Livigno, or Kronplatz or Madesimo. These resorts are benefitting from the fresh snowfall coming down more heavily over Austria and Eastern Switzerland. These would definitely be the resorts to go to if you are hoping to enjoy good snow conditions while remaining in Italy. Current forecasts indicate there will be little change over the coming days, with those resorts already seeing snowfall likely to continue to do so, while elsewhere there is little expected until early next week unless there is a noticeable change. Artificial snow and bright skies were the key points to note with respect to the conditions across Andorra. Still without snow for approaching three weeks, the slopes are predominantly a mix of very old hard packed snow and mad made production, with no real off piste available. Despite it being mid-January, it was only slightly below freezing at the summit, and above freezing in other resorts, with much of the mountain away from pisted runs still uncovered by snow. Levi reported fresh snowfall on January 3, however beyond that there is sizeable percentage of terrain that has remained unopened due to lack of more substantial coverage. In Sweden, Salen was faring substantially than Are, with 12cm overnight in the former and a far wide range of terrain open. In Are, the resort was forced to close a handful of trails while they add artificial coverage to maintain their quality. Several resorts across Norway have reported 5-10cm of overnight snowfall, including a number of slopes around Lillehammer, Geilo, and Tyrsil faring the best with 12cm overnight, although all resorts across the region are lagging behind last season's snowfall and base depth measurements. Conditions were overcast on earlier in the week, but it's now sunny. Although webcams on Tuesday showed a lull in the snowfall, plenty more is expected to come over the next two days, adding as much as another 50cm at higher altitudes. It was still snowing in the Czech Republic, with fantastic wintery scenes among the trees in Špindler-¯v Mlýn. It's likely the snowfall will continue over the short term, building up a real improvement in the base depths in resort. Other than some intermittent sunny spells, current forecasts show continuing cloud cover across the majority of the region, some welcome news for resorts with occasionally see less snowfall than Alpine resorts. The Sierras, principally Mammoth and Squaw Valley have seen fantastic snow conditions this week, as have resorts in Utah, boasting some of the most substantial snowpack's across North America currently. Forecasts seem to agree that, excluding the coming couple of days in New England, there is no further substantial snow on the horizon, instead mostly bright, mild days in the central Rockies and more westerly resorts. Much of Canada continues to enjoy fantastic skiing, with great amounts of fresh snow. It looks as though the intense period of heavy snowfall has finally moved on from British Columbia, but not before giving 133cm of snow in Whistler over the past week, helping the base depth creep above 2.5m and great conditions on the upper slopes in particular. Other resorts have not seen as great an amount of snow unfortunately, with some pretty varied quantities elsewhere in the state. The temperature has dropped since the start of the year, bringing it more in line with expected seasonal levels. This weekend will bring an end to the period of weather dominated by cloud and snow, instead heralding brighter, clear yet cool days - ideal skiing conditions for January.